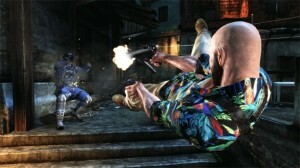 Max Payne 3 is a third person shooter developed by Rockstar Vancouver for the Playstation3, Xbox 360, and Windows. I rented it for the PS3 from Game Access. The story follows Max as a retired detective who spends his days in bar and his nights feeling sorry for himself for losing his wife and child (presumably in the previous game, which I didn’t play). The game starts In Media Res and tells most of the story through flashbacks that you play through. As the story progresses you learn that Max was living out his days in Hoboken, New Jersey before Raul Pasos shows up and offers him a job in private security. After Max gets into a lot of trouble with the local mafia leader he decides to take Pasos up on the offer and takes some jobs in Panama and Sao Paolo, Brazil. Most of the story is told out of sequence, and revolves mostly around the people Max is supposed to protect being kidnapped. The great part about telling the story in this way is that Max can add internal monologue while you are playing to help guide you to where you should be going next. Things such as if you are wandering around a room wondering were to go next, he will say something like “There was no one left in the room so I figured they must be out on the balcony”, which gives you a subtle nudge in the right direction. This really helps to keep the game moving, and even provides some indication of time sensitive mission tasks without the need for a countdown GUI, because he will say something like “There was no time to waste, if I didn’t get after the girl she would be dead”. Since I hadn’t played the previous Max Payne games, I wasn’t expecting such a great story told so well. There are a lot of cut-scenes but they are used only to tell the story, not to replace a great action scene, and when you play you are playing the action. This is what Metal Gear Solid games get so wrong, because Konami doesn’t trust you to do the amazing action they want to choreograph they make it into a cut-scene and give you control to walk down a hallway and open a door. Max Payne 3 isn’t filled with a lot of twists and gimmicks, but there is some definite surprises and they are told very well, and hit the right mood. The voice acting is great as well, all the characters are well suited to their roles, and they even worked on ensuring a Columbian speaks Portuguese with a slightly different accent than a Brazilian. There is great attention to detail, when the characters are talking their lips are matched to their words, even in scenes that you are controlling the characters and they are just talking back and forth. It’s something that could easily be missed but since it’s there it adds that greater polish. Another thing that really impressed me was that if I pick up an Uzi I am holding that Uzi in the cut-scene that follows. This may seem like an obvious thing, but after playing Assassin’s Creed 3 and watching as my outfit and weapon changed back to default for every cut-scene I realize it’s something a big studio like Ubisoft can easily miss. For the most part, the controls worked really well. Combat was fairly fluid and there was plenty of opportunities to play however I liked, including slow diving through the air and shooting as many people as I could before I hit the ground. There were only a few times where I would get stuck to some cover and was not able to do anything at all. The controls would become almost completely unresponsive until I managed to roll out of the way (in a few instances), was shot enough to automatically slow dive, or died/reloaded. This is, as far as I could tell, the only bug in the game when I played it. All in all it’s a solid game with a great story and fantastic polish, I would recommend it to anyone to try out. Cons: A few bugs with cover, and a few instances near the end where I wasn’t completely sure what I was supposed to do.